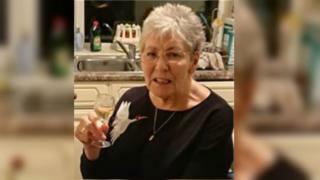 A 77-year-old woman who was found dead at a house in a Derbyshire village has been named by police. Dorothy Bowyer's body was discovered by officers in Western Lane, Buxworth, in the early hours of Thursday. A dog was also found dead at the property. William Blunsdon, 25, of Buxworth, who was arrested shortly afterwards, has been charged with her murder and criminal damage. He is due to appear at Nottingham Crown Court on 15 March.